How good are your children at cracking codes? This is your chance to find out. 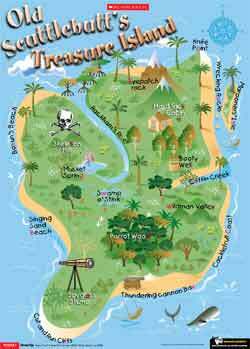 Their challenge is to find the location of some hidden pirate treasure. To do so, they must crack a code and translate Old Scuttlebutt’s scrambled instructions, visit the five places being described and collect and unscramble letters to reveal where the treasure is buried. Working out how to use the code on the activity sheet below. Using it to translate Old Scuttlebutt’s instructions. Using the map to work out the places being described and writing these on the activity sheet. Writing the letter written in RED (on the map) in the place name being described in the clue. Unscrambling the letters to reveal the location of the treasure.